Scrape away the media sensationalism and geopolitical posturing and it boils down to a simple dynamic: follow the energy. Though many seem to believe that internal politics and geopolitical posturing in Ukraine are definitive dynamics, I tend to think the one that really counts is energy: not only who has it and who needs it, but where the consumers can get it from. Let's cut to the chase and declare a partition along long-standing linguistic and loyalty lines a done deal. Let's also dispense with any notions that either side can impose a military solution in the other's territory. Media reports on the weakness of Ukrainian military forces abound (for example, Ukraine Finds Its Forces Are Ill Equipped to Take Crimea Back From Russia), but Russia's ability to project power and hold territory isn't so hot, either. RE: Russian Army. Effective draft evasion is running 80%. Morale is low, training is very poor and poorly funded. The Russian army has also gone through 22 years of near continuous contraction. And this standing army has heavy commitments in the Caucasus and Far East Siberia. Moreover, at least half of these Russian ground troops are short term 12 month conscripts. I don't think these kids will produce many usable and motivated troops. The low morale recently seen in the Ukrainian Berkut and other police will be multiplied by at least 10x. Russian speaking Ukrainian bands are rumored to already be crossing the borders into Russia territory. They're to be ready to sabotage bridges and infrastructure and generally retaliate. Fluent Russian speakers with many years experience of living in Russia. Who can say for sure if this has already happened or is just being threatened? We can say this is a very real danger. These people look just like "Russians." And we can also say this threat will seriously complicate Russian rear area security and logistics. And speaking of logistics, the distances in south Ossetia and Abkhazia were very short and the populations were entirely friendly. Neither condition prevails in the Ukraine outside the Crimea. Supplying moving armored units over hundreds of miles of occupied country is very difficult logistically. The logistics for air assault helicopter units are just as bad. These helo units look mobile but they're a lot like a yoyo being twirled around your head on the string. They only go fast within a fixed radius anchored by logistics that are about as heavy to move as an armored division's supply columns. That is years in the 101st Airborne Division talking. The fuel consumption rates are immense. Stuff starts breaking down fast. Conclusion: a de facto partition is already baked in because neither side can force a re-unification. Various jockeying and posturing will undoubtedly continue for some time, but the basic end-game is already visible: de facto partition. Let's move on to correspondent A.C.'s observations about energy. This map rounds out the European energy Rosetta Stone. When they hear that Italian fighter jets are over Tripoli, or that the French Foreign Legion has returned to the deep Sahara Desert, they can can better understand the reasons and real objectives of such operations. Many have noted that the Russia economy is critically dependent on oil and gas exports to the EU. It should be noted that the converse is less true every day about EU dependence on Russian oil and gas. The Wall Street Journaleven had a line about an EU proposal to push natural gas EAST to the Ukraine. 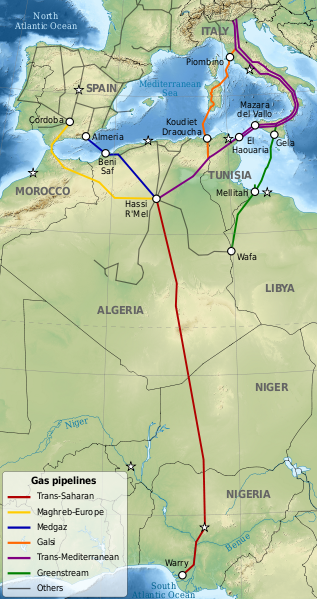 It's hard to understand that passage or where the natural gas could come from unless one understands the North Africa to southern Europe gas pipelines. 1. The natural gas discoveries in eastern Poland and western Ukraine played the largest role. 2. The reduced importance of the gas pipeline running through the Ukraine to Europe as compared to 2009. Since that time the Nordstream lines have been finished and Gazprom acquired commercial control of the Belarus pipeline. The South Stream lines are well along in development. 3. Fast developing liquid natural gas (LNG) seaport terminal infrastructure. Events in Libya, Mali and Algeria are not hermetically isolated from this. They are part of a comprehensive energy policy problem being dealt with by the same leaderships. It increasingly looks like a series of peripheral Energy Wars that are being fought out for control of Europe. LNG exports are going to become a weapon in the struggle for geopolitical influence and control. The Ukraine is not the only country becoming less systemically important to Europe for natural gas supply. So is Russia. Current events will only accelerate everyone's efforts to diversify away from such an unstable and apparently dangerous supplier. I think the long-term fallout from the Ukrainian Crisis will be similar to China's attempt to exploit its temporary low price monopoly position in rare earth metals a few years ago. The result is rare earth metals are becoming less rare by the day as alternate mines outside China are opened and reopened. Thank you, A.C. Scrape away the media sensationalism and geopolitical posturing and it boils down to a simple dynamic: follow the energy. Thank you, Charles M. ($5/month), for your most excellently generous subscription to this site -- I am greatly honored by your support and readership. Thank you, Joel H. ($5/month), for your wondrously generous subscription to this site -- I am greatly honored by your support and readership.